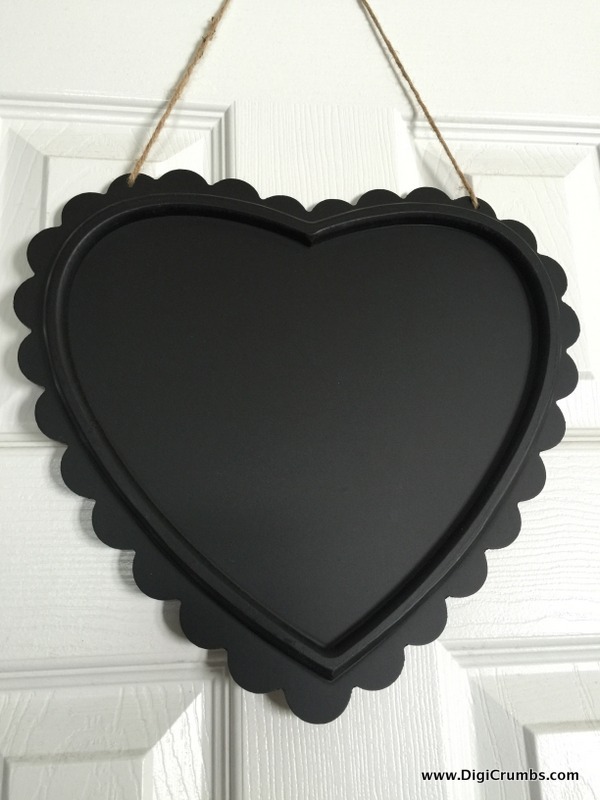 While I was shopping at Target, I spotted this chalkboard heart in the dollar spot!! That dollar spot always gets me…this time it was actually $3. I really love the look of this heart and thought it would make a great addition to our kitchen as Valentines decor. I like to add special touches around the house to help celebrate each holiday (especially with kiddos in the house), because they notice the details and get so excited over the little things. Here’s our new heart chalkboard hanging on the front of our pantry door. 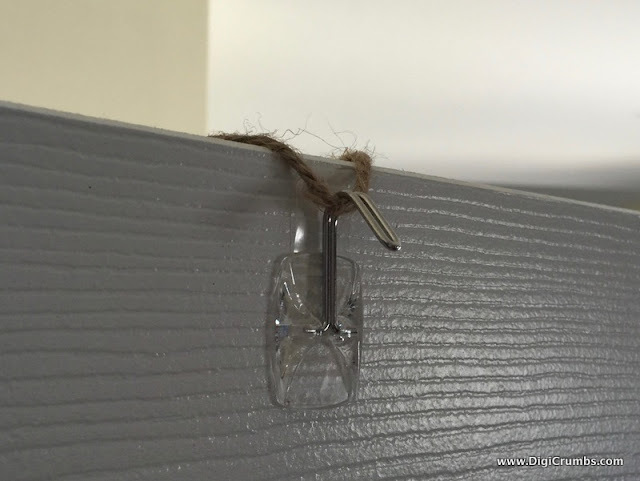 I attached it using my easy behind the door upside down hook trick. Check it out! Now I need to decide whether to add a Valentines Day countdown or a quote to our heart chalkboard. Maybe I’ll let the kids take turns creating a design of the day?! Lots of possibilities!! 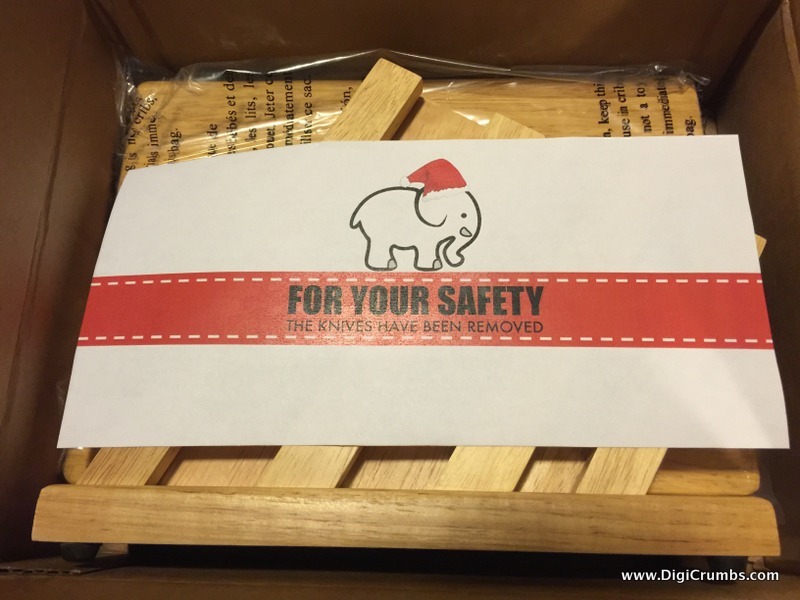 We attended several holiday parties featuring the increasingly popular white elephant gift exchange. I thought I would share a few of the unique, crazy, and comical white elephant gifts that were up for grabs this year! This white elephant gift was brought home from a family Christmas party. The box was wrapped with signs indicating “fragile” and “handle with care”. After carefully removing the gift wrap, the barely secured salt water taffy box gave a small hope this was going to be something good, but the weight of the package was a sure sign this would be a doozy of a white elephant gift. 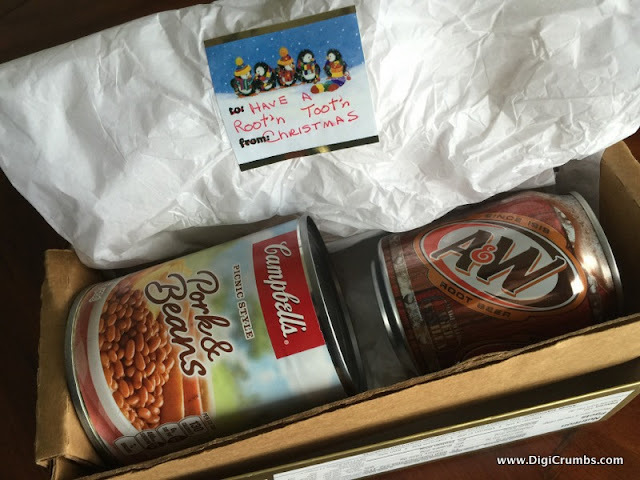 Sure enough, it was a can of root beer and a can of baked beans with the lovely sentiment to “Have a Root'n Toot'n Christmas!”…good times! This fine wooden cutting board and knife holder set had the knives it originally came with removed…for safety of course! At least the wooden cutting board is useful, right?! 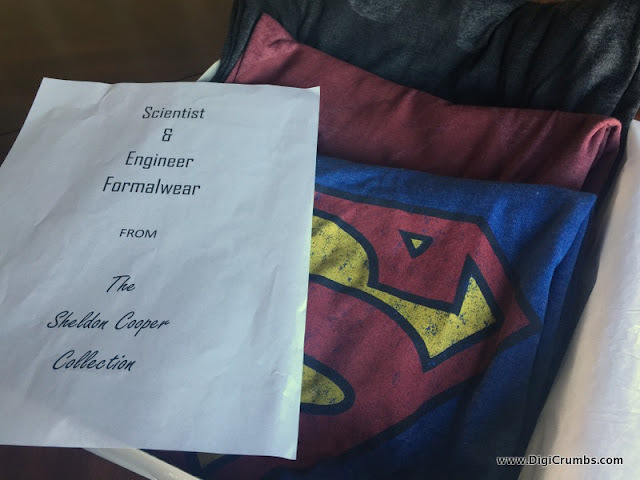 Superman, Batman, and Flash T-Shirts from Old Navy with a paper included that says “Scientist & Engineer Formalwear from The Sheldon Cooper Collection”. This one was actually a great gift, useful and packaged funny! What do you do when your kid receives one of those gigantic, artificially colored rainbow swirl lollipops (made in china) from a birthday party? Make it into a white elephant gift of course! 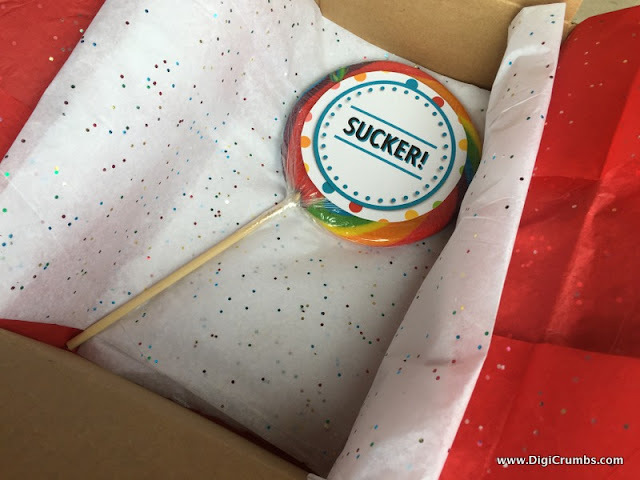 Wrap it with a message that says “This may be the sweetest gift at the party this year!” When the recipient opens the package, they see their gift with the label “Sucker!”…whah wa. If you’re not feeling creative or like you have a lot of time to put into your White Elephant Gift, check out Poo-Pourri Before-You-Go Toilet Spray (the accompanying commercials are hilarious). Yes, it’s a real product and it makes for a super easy, possibly useful White Elephant Gift. Too bad I already had this year's gifts together, watch out for next year! My son made this easy mini paper plate pumpkin craft in first grade as they carved their class Jack-O-Lantern for Halloween. This craft kept all the kids busy as they each took a turn to pull out some of the pumpkin guts! It was super fun and I was happy it happened to coincide with the day and time I help out in the classroom. Supply List: Mini Paper Plate, Tissue Paper Squares in shades of orange, Brown Construction Paper rectangle for stem, Small Square of Off White Construction Paper for the kid to cut out pumpkin seeds, Orange Crayons to color the border of the paper plate, and a Glue Stick to paste it all together! It can be a challenge to keep the kids busy on super hot or rainy days when we're mostly indoors. 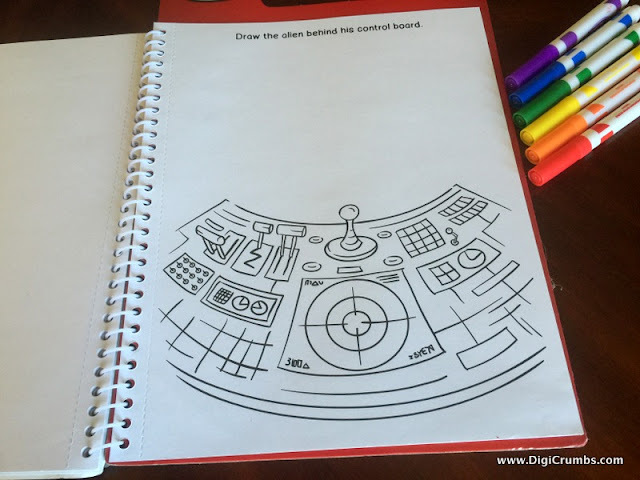 I thought I would share this summer boredom buster, when I realized how much my son loves working on this IMAGI-Sketch Artist Book. He received this Finish The Drawing Book as a gift, but it is available on Amazon or you could make your own by simply cutting out part of a picture from a magazine and gluing it to paper. For example, check out this page from the book. It features a sketch of a control board and instructs the artist to draw an alien behind the control panel. These finish the drawing art activities keep him busy and it’s fun to see what he draws. Sometimes he sketches an accurate completion to the drawing and sometimes he designs something unexpected and silly! Either way he’s using his imagination and creativity. The resulting drawings make one of a kind, conversation starting art to display on the refrigerator or mail to a relative. My son made this bright and cheerful rainbow paper plate craft in Kindergarten. Using half of a paper plate, he painted each color of the rainbow and glued on rainbow streamers. 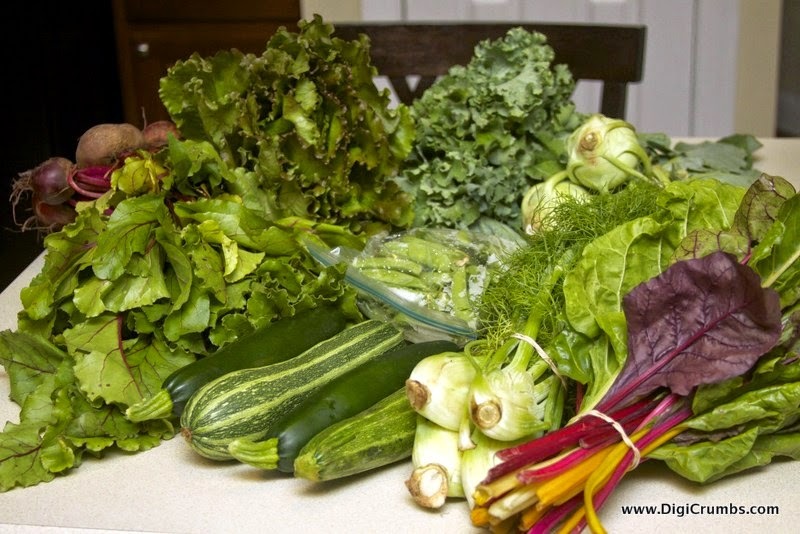 It is so fun and colorful that we put it on display in our kitchen. Even my 2 year old gets excited about her brother's craft, she loves to stop and tell us all the colors of the rainbow when she walks by. 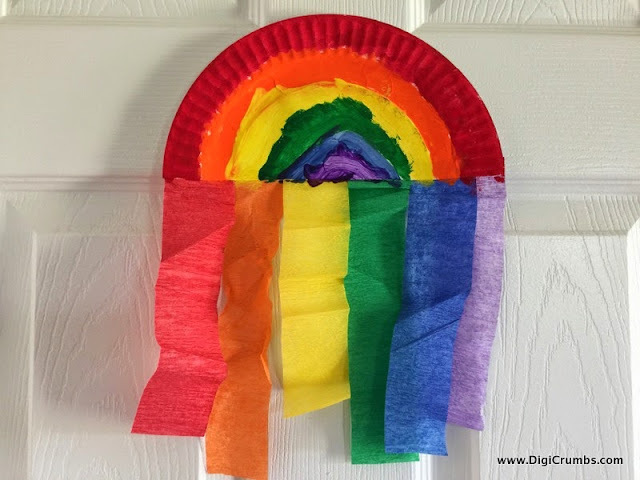 We may try to recreate this rainbow craft at home. We have all the supplies except for streamers in every color of the rainbow, so we’ll glue white fluffy cotton balls to the bottom of our painted rainbows instead of streamers to add clouds. Arrr! We've gone a little pirate crazy around here with another fun snack to share with the PreSchool class. Since my son loves cooking, the process of dreaming up a new snack idea or finding one online to try is something fun we do together. We decided to send in a whole fruit, a banana, for each student. 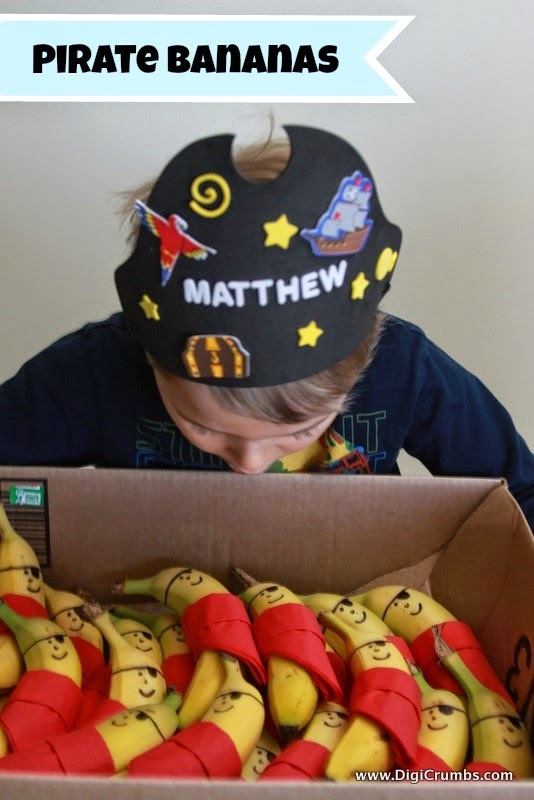 To make it fun, we turned each banana into a pirate (totally pinterest inspired by this photo). We also sent in a bag of Pirate’s Booty, which are basically cheesy poofs with a short ingredients list. To make pirate bandannas, we folded red napkins, then wrapped one around each banana securing it with tape. I used a black marker to draw the pirate faces and verified the marker did not pass through the peel and damage the fruit. From what my son reports, every kid wanted a pirate banana and some even asked for seconds! He was so excited when he came home from school that he wanted to turn an orange as well as a list of other food items into pirates. I love his enthusiasm and never ending big ideas, but we decided to come up with another theme for our next fun food adventure. A healthy pirate banana would make a great addition to a lunch box too.